The holidays hold such wonderful memories for most of us. Sometimes, those memories are based off of one special moment in time and others are passed down from generation to generation. Now that Hanukkah has passed in our home, we are preparing ourselves for Christmas. Our tree is up but that is about it. While decorating our tree, I thought about the traditions we upheld while decorating the tree that I passed on to my daughter in that moment and the others to come over the next few days and how much language practice can take place during the holidays. DECORATING THE TREE: My little one is six years old, so a lot of the ornaments we have do not hold the same special memories for her yet. However, she sure loves hearing the stories. For each ornament that we pull out (beyond the basic store bought ones), I tell the story of how it became part of our family history. I purposely lead up to a point and stop. By doing so this sets the stage for her to ask questions. For example, I pull out the menorah shaped ornament and tell her the story of the first Hanukkah and Christmas that her father and I shared. HOLIDAY BAKING: Recipes are great for Language! My entire childhood, we made chocolate chip cookies the night before Christmas (but we rarely left any for Santa). I am continuing this tradition with my daughter. However, it will have a Christmas twist by using Christmas and Hanukkah Shaped cookie cutters. While reading the ingredients aloud, I have her identify each item. By leaving one ingredient out, she has to figure out what item is missing and inform me that it is missing. I read the directions out loud and have her summarize and tell me the steps back. I will read 2-3 steps aloud this year before having her retell me the steps. However, if you are unsure if your child is prepared for that, I suggest starting with one direction at a time and building up to two or three steps. Temporal concepts can also be introduced during this activity (i.e. “What did we do before we put in the chocolate chips?”) and sequencing (i.e. “Do you remember all of the steps to making the cookies? What did we do first? Next? Last?”). GINGERBREAD HOUSES: Making gingerbread houses is just SOOOO messy and SOOOO much fun! We do one EVERY year in our home. While we make ours, we talk about all the “sweet” stuff we want to bring into our home that year (love, peace, kindness to others, new friends, etc…). However, it is also a wonderful opportunity to work on prepositions, following directions, descriptive concepts, and making requests. While working on the gingerbread house as a family, parents are able to model making requests instead of just grabbing for the item (“Please pass me the frosting”). You can make a game out of decorating by taking turns giving descriptions of ingredients and directions on where to place an item (“This item is red and white, it is sticky, and shaped like a cane. Put it under the purple gum drop candy that is next to the window.). Who is the best at following directions or describing items in your home? HOLIDAY SHOPPING: Okay, I have a small confession. I detest shopping (unless it is at a bookstore or a bubble bath store). Seriously, we would probably starve if my husband did not do the grocery shopping. That being said, I think holiday shopping for others is about the only other time I can enjoy it. However, I found that holiday shopping with a little one is not always as fun since she gets bored so easy (after all, it isn’t all about her and toys). So this year, I started following my own mother’s lead. When we would go shopping for my brother or my father, she would start to talk aloud about them and their interests. I thought my mom was a tad crazy (shhhh… don’t tell her I said that). Now, I get it. She wasn’t talking herself through the shopping experience but she was doing it to engage me in the activity. For example, if she knew my father needed slippers she would say something like this, “He enjoys sitting in his chair and reading the newspaper. However, I have noticed that lately he has made comments about his feet being cold when he does this. He hates wearing shoes though. Also, he doesn’t like just walking around in his socks. Hmmmm… what do you think we should get him?” A couple times, I actually thought my mother was losing it. She couldn’t just come up with Slippers?! Plus, she was talking to herself A LOT! Little did I know that she was just trying to keep me entertained while making me feel like the gift idea was mine. She is savvy. By describing a situation, we were working on inferencing skills and I was too busy thinking to complain about the hours we spent shopping in the mall (which I detest to this day!). Language truly is all around us. We only need to seek out these natural opportunities to build language skills in our children by modeling, expanding our own language, and wrapping them up with pretty bows to create warm memories for our children and possibly theirs. 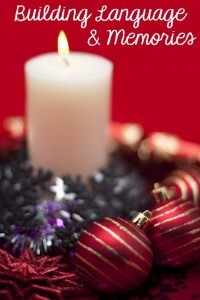 What holiday traditions do you have that possibly builds and reinforces language skills? Great ideas for building language into every day and holiday routines.